You won’t instantly recognize an iPhone running iOS 12. For those upgrading when iOS ships this fall, there’ll be some “who moved my cheese?” moments, but iOS 12 is not a radical departure from iOS 11, it’s a features and performance update. The changes are, as we learned in June at Apple’s World Wide Developer’s Conference, sprinkled throughout the decade-plus-old operating system. 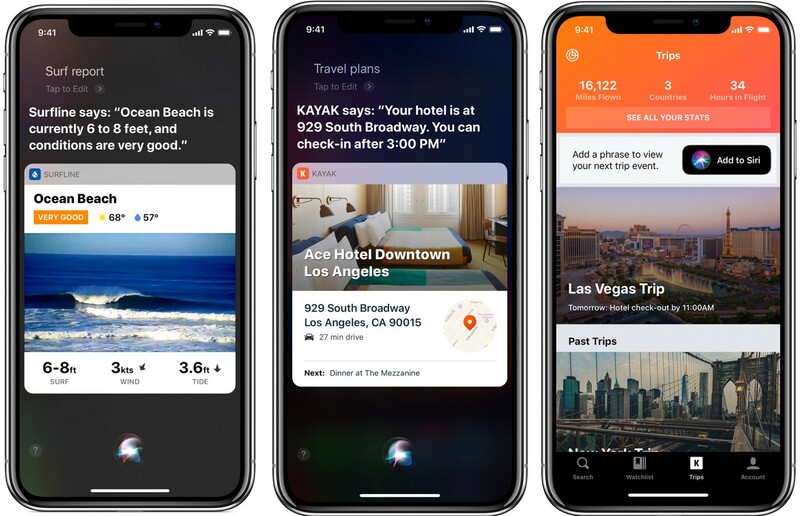 Many of them are infused with Apple’s new secret sauce, local Machine Learning (ML); throughout the platform are new For You tabs that serve up curated information, actions and content based on your interests, activities and contacts. With, I think, weeks left before iOS 12 lands on millions of iPhones, I wanted to take a closer look at some of the more interesting and meaningful changes to the venerable mobile platform. In the early days of the iPhone, I used the rapid scroll to find a particular photo, hoping my ability to scan through hundreds of scrolling images would result in a jackpot find. The more photos I had, the less this worked. 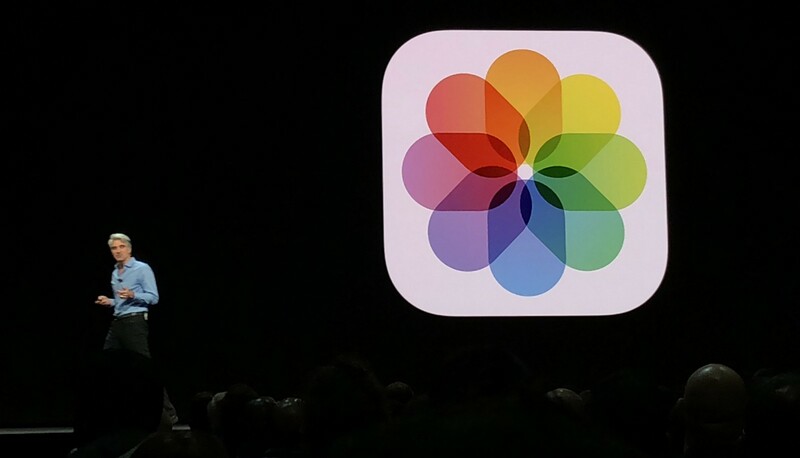 Over the years, Apple’s iOS Photo tool has gotten much better at helping me find photos through organizational principles like places, people, and image categories. It’s an imperfect system that gets much more powerful and effective in iOS 12. Now, if I have just the faintest idea of what’s in my desired picture, the redesigned Photos can help me find it. 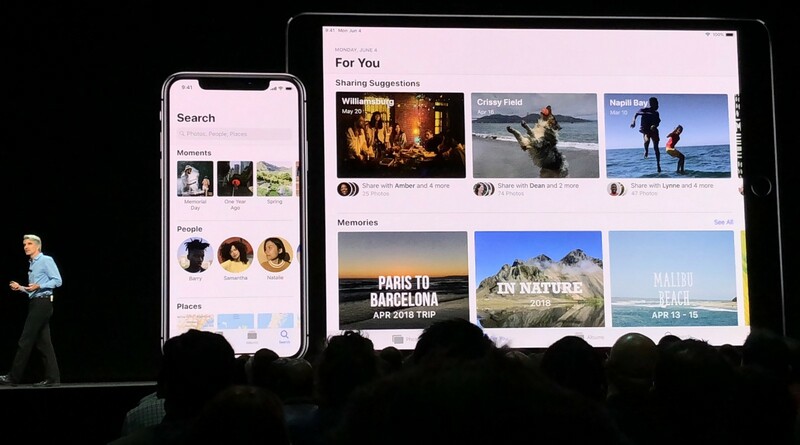 The Photo Search redesign starts by moving the search icon to the same horizontal space as the rest of the core Photo tools (replacing Memories). iOS has been using object and scene recognition since iOS 11, but with iOS 12, you’ll more easily enjoy the fruits of that digital labor. If I remember a person, I can start with that face and then add another, often suggested, keyword that puts them in a certain place (a city), during a certain time, at a kind of activity (a concert). I can even add in brands, like my favorite team, the Mets. Put another way, I can search for my daughter holding food at a Mets game. Photos lets you search the way you think. In my experiences with the beta the results aren’t always image gold, but they’re often very good. iOS 12 is always thinking of You. For You in Photos can seem a bit pushy, showing me how it thinks I could edit my photos (I try to take them so they don’t need editing) and always encouraging me to share photos with friends. Yes, based on the integrated facial recognition, it will even suggest with whom you should share photos. Photos, however, doesn’t know who these share recipients are until you tie faces to your contacts. In the beta, the system often found me and then suggested I share with myself. However, if you use Photos within Messages, it can suggest images to share with your message recipient. It’s also clear to me that as Photos in iOS 12 indexes more and more of my photos and pores over them with its ML data harvester, I’m going to reap the rewards, with more and more serendipitous image discovery. One of the things Apple does well is tying disparate systems together. So, the ML benefits found in Photos search are married to the increasingly ubiquitous intelligent assistant Siri. I can now daisy-chain together voice queries like “Show me photos of Lance wearing a hat” and the screen opens to a gallery of chapeau-wearing Lances. Now I’ve worn hats all over the world, but I could never get Siri to find a picture of me wearing a hat in, for instance, London. Siri’s biggest iOS 12 update, however, is Shortcuts. When Apple announced them at WWDC, I understood them to be new customizations for third party partners, sort of write your own scripts. That’s kind of the idea, but not exactly. Part of the problem is that, in this beta period, few, including me, have seen Shortcuts at work. They don’t appear in notifications and the promised Shortcuts app is nowhere to be found. That’s because third-party app developers have to integrate Siri shortcuts into their apps, so you can start creating them. Among those promising Shortcut app integration are Walgreens, TripIt, TripAdvisor, United and American Airlines, and Kayak. I recently saw demos with apps like Sky Guide and Surfline. Both will show a small Siri shortcut prompt. Once you select that, you can access a Siri command in, for instance, Sky Guide that lets you point your phone at the sky, launch Siri, and say, “What star is that?” The result is a combo of the Siri voice, text that repeats the response, and images and details about the star from the app. Similarly, a request to Siri for a localized “Surf Report” for a selected area brings back Siri’s response and a Surfline card featuring a live-cam image of the beach and surf conditions. 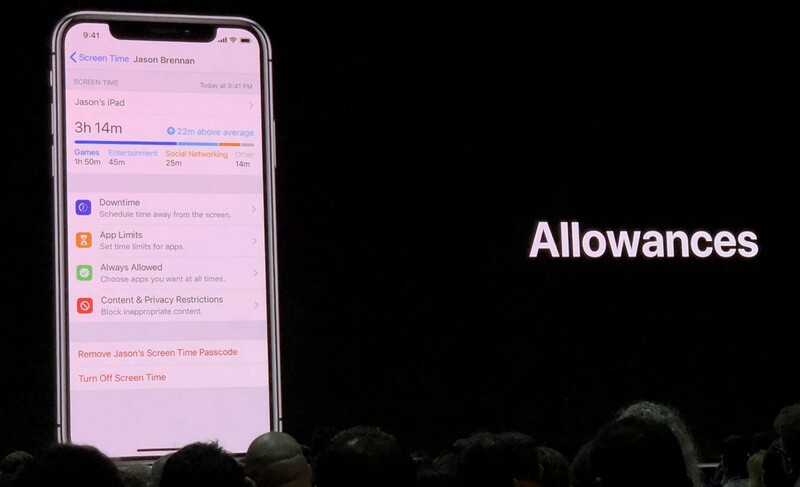 iOS 12 will use machine learning to suggest new Siri Shortcuts based on your activities. If you text someone a lot when you’re in a certain location or at a certain time of day, you might see a suggestion in notifications or by dragging your home screen to the right. Again, the more third-party apps that support Siri Shortcuts, the more of the suggestions that will pop up on your lock and widget screens. Shortcuts App, which arrives in the App Store when iOS 12 launches to the public, is, even in early beta, a rich tool for building your own Siri scripts. Shortcuts lets you start building events with Calendar, Contacts, Health, Maps, Music, Photos and Video, Text, Sharing and Web actions. You can even do some scripting (opening prompts that ask questions and expect certain answers). The app also lets you record custom Siri phrases and gives you fast access to Shortcut widgets. Recently, Apple showed me how someone could build a Bedtime shortcut that closed the blinds, turned off lights , launched an audio book and had Siri announce tomorrow’s schedule based on the calendar. However, my early sense of this app is that building such a script might be more than many iOS users can handle or need. Overall, Siri has a lot of power, but it still often feels hidden under a bushel. We talk to Siri when we want to answer questions and then forget about it. Apple’s hoping that this kinds of hands-on experience with Siri will make it more of a presence in people’s lives. I’ve written quite a bit about Apple’s new Screen Time and how it might change our maybe too-close relationship with our iPhones, but I’m especially interested in how these tools might encourage parents to finally regain control over how their children use their mobile devices. Screen Time has a lot of options for managing not only your own, but your children’s screen time. Screen Time is not just about measuring time on entertainment, productivity and social media apps and enforcing downtime, it’s a set of tools for controlling what your children can do on their phones, when they can do it, and for how long. As soon as you turn on Screen Time, it asks if the phone is for you or your child. If it’s the latter, iOS 12 guides you carefully through the setup process, which, thankfully, isn’t that complicated. And, in practice, I can see how easy it is to maintain control. One screen can change so much. Instead of setting limits for every single app, parental control in Screen Time defaults to categories (you can dig to app level, if you choose). This is smart. If you set parameters for game apps, a new game installation will automatically adopt the existing rules. In one demo I saw, Minecraft wouldn’t open on an iPad (the app was grayed out) because the user was past the app time limit. The iPad offered the option to ask for more time. That request appeared immediately on the iPhone, but only once. If the parent ignores it, the child can’t ask again and again. Where was the real-world version of this technology when I needed it? Of all the iOS 12 updates, the iBooks to Apple Books transition generated the least amount of interest. But it’s worth noting the time and effort Apple put into redesigning its books experience. The company that walked away from skeuomorphism is obsessed with showing book covers and even portions of the bindings in their digital books. It’s a concerted effort to woo physical book lovers, perhaps those who still favor paper and print over Amazon ebooks. 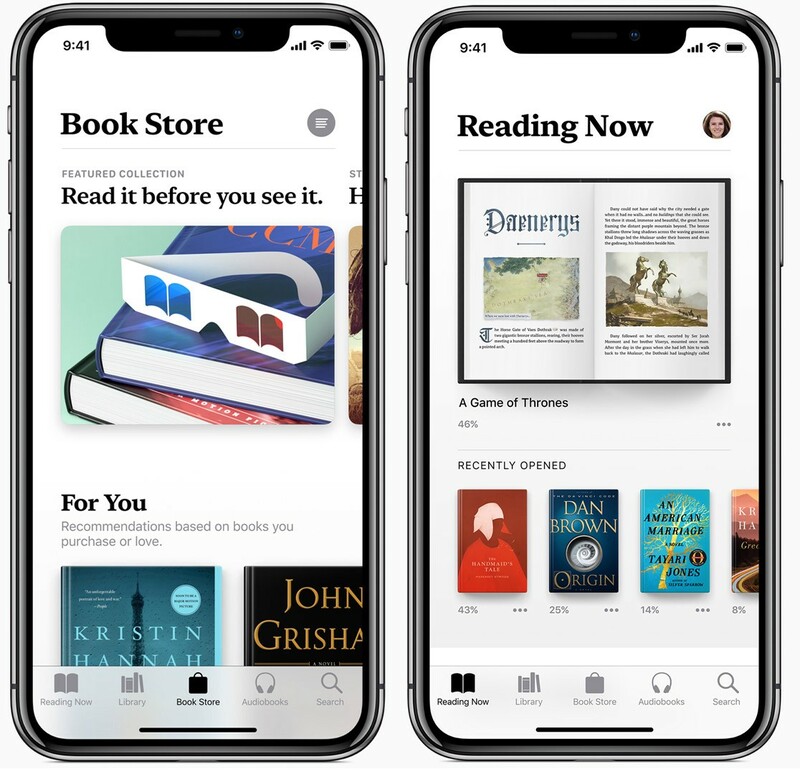 Apple’s smart enough to open the app to whatever you’re reading right now, so it’s more like a real book and, to a certain extent, mirrors the experience you’d find on an eReader. If you haven’t gotten the message by now, Apple knows you. It does deep, yet localized Machine Learning to learn your tastes, which, as with other native apps in iOS 12, is reflected in a helpful For You Section. This side-scrolling list of book recommendations is based on previous purchases. I’ve read virtually nothing in iBooks, so my recommendations remain a bit thin. Books also integrates audio books that you can buy without a subscription, which is a gentle dig at Amazon’s annoying Audible service. Oddly, Apple has done nothing to integrate with library lending systems. Maybe in iOS 13. The performance change is the simplest story to tell. With iOS 12, Apple says you’ll see faster app launches, smoother operation and smarter battery consumption. It’s a promise that’s relatively easy to keep with the iPhone X and its A11 Bionic CPU, but naturally more of a challenge for phones that weren’t developed with iOS 12’s features in mind. However, with the choice to support iPhones going back to the five-year-old iPhone 5s, Apple had to make this a more efficient iOS update than previous versions that have knee-capped iPhones just a few years old. 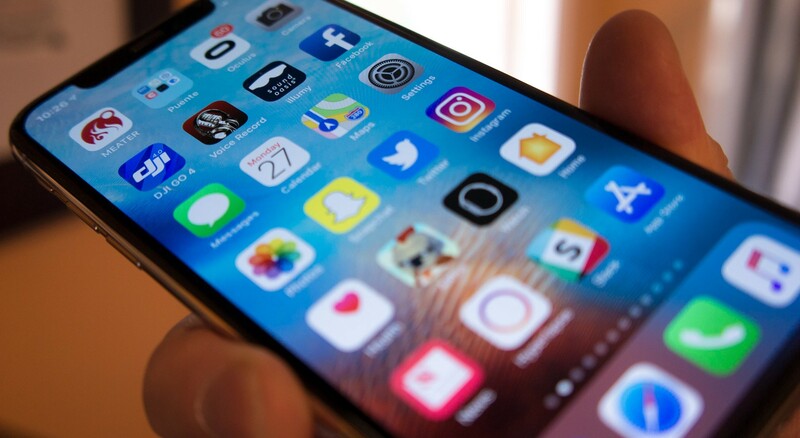 Apple has promised that not only will this update not harm these older phones, but, at least going back to the iPhone 6, it could enhance performance. I’m now anxious to try iOS 12 on my wife’s iPhone 6s, though I know she’ll prefer to wait as long as possible to install the upgrade. An operating system is like a beautiful car: a rigid, polished skin holding together thousands of small details that comprise a full experience. The iOS 12 features I’ve outlined here are like an inventory of the main dash. Even without a major platform redesign, there is much more to explore on the surface of iOS 12 and under its hood. I’ll get to it all, eventually.